1. The Jungle Cat Queen! 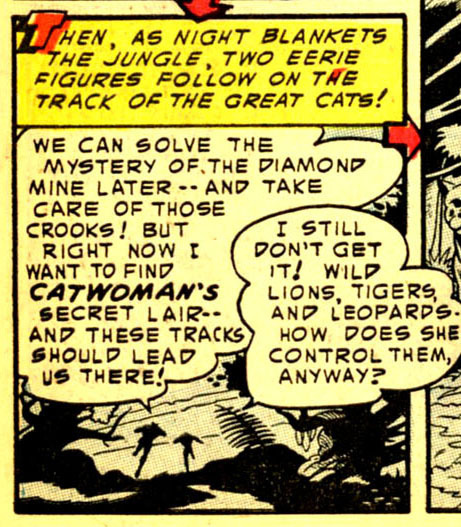 Catwoman steals some diamonds and flies away in her Cat-plane. I love that she can pilot her own aircraft. It’s unusual during this time period for a female character to be so empowered, but sister is doing it for herself! Robin can’t believe Catwoman used a panther for her robbery. 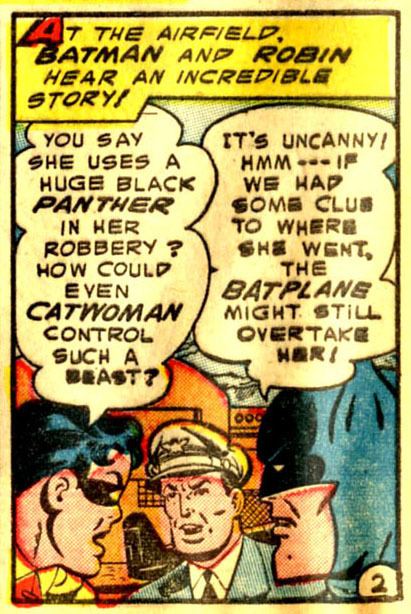 In fact, even as the Dynamic Duo pursue her in the Bat-plane, he’s still going on about it two panels later. 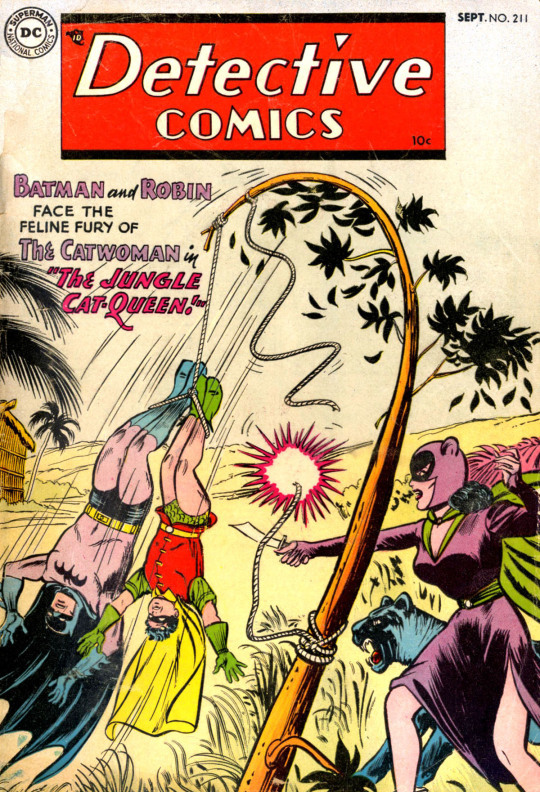 Catwoman uses the Cat-plane’s claws to rip the Bat-plane’s wings and force it to land on her secret island hideaway—which Robin notices is also home to a diamond mine. 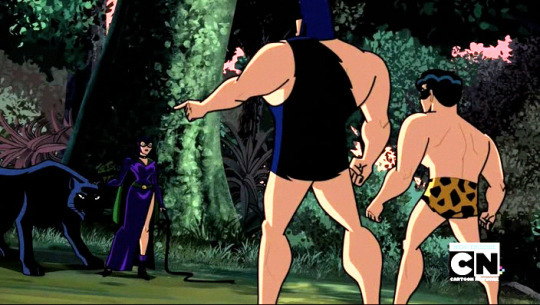 Batman and Robin are quickly caught by Catwoman’s associates, but instead of killing or unmasking them, Catwoman would rather play a game. She strips them of their costumes (but not their masks) and dresses them in “jungle clothing”. Coincidentally, these clothes are identical to the outfits they wore in “The Jungle Batman” published in Batman #72 two years earlier. Our heroes are then turned loose so Catwoman and her cats can hunt them down and unmask them. 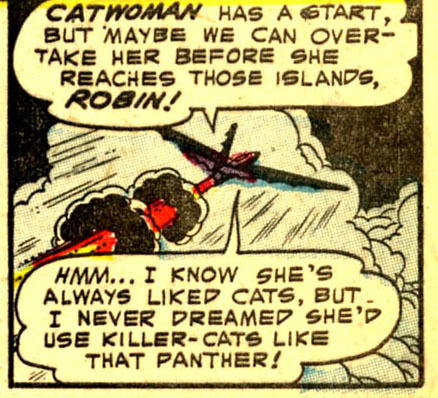 As they are pursued, Robin can’t stop thinking about Catwoman’s big cats. Soon, Batman figures out that the cats are trained, obtained from a circus. Or maybe he’s just saying that so Robin will shut up about them. 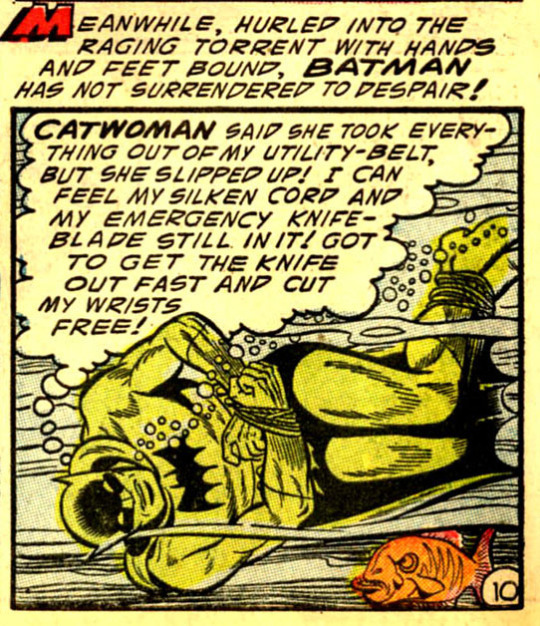 At any rate, Batman is caught while Catwoman mistakenly believes Robin is killed in a struggle. 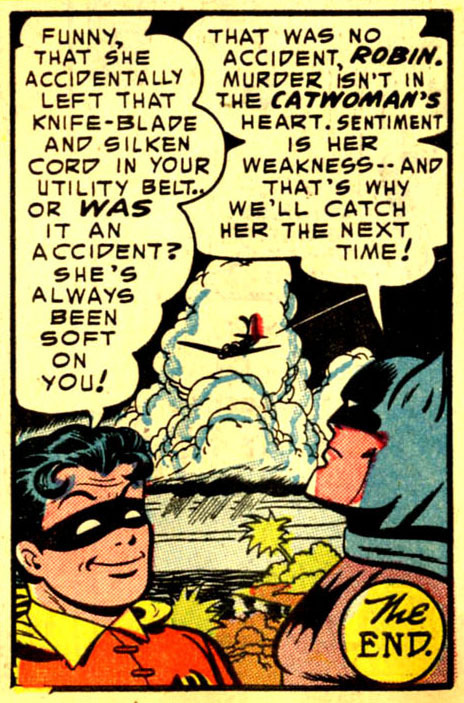 In all the excitement, she forgets to unmask Batman—in fact, she gives him his costume back before tying him up and throwing him in the river. But what’s this? Did Catwoman make a mistake? So Batman escapes—avoiding drowning and going over a waterfall. Reunited with Robin, they round up Catwoman’s cohorts who were “laundering” stolen diamonds, pretending they came from their mine. Catwoman, however, gets away. But “next time” wouldn’t come for another 13 years. In a few months the Comics Code Authority would impose guidelines on the comics industry requiring a more black-and-white approach to criminals. 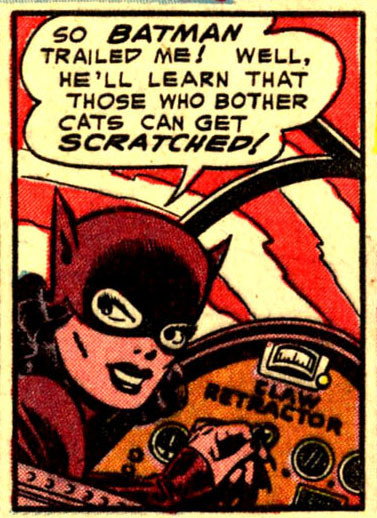 For a while, there would be no room in comics for an ambiguous character like Catwoman. FUN FACT: The Cartoon Network show Batman: The Brave and the Bold has a 2011 episode, “Shadow of the Bat”, that starts with a teaser loosely based on this story. 2. Menace from Outer Space! 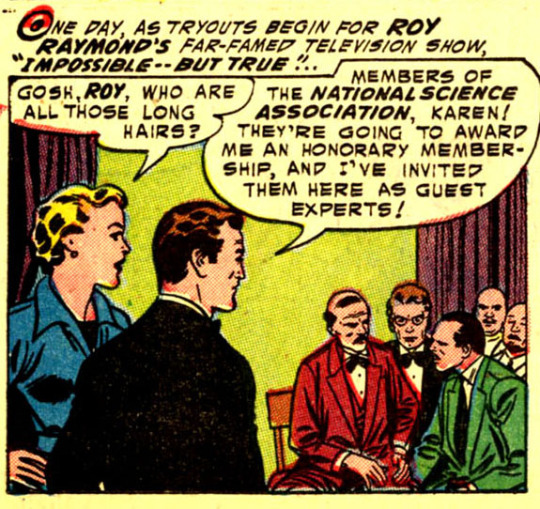 Roy Raymond hosts the show “Impossible—But True!” on TV. Before anyone can appear on the show, Roy and his assistant Karen must investigate the claims of prospective guests and expose any hoaxes. Strange premise for a comic book series, but it had been going on since 1949. Beginning their day’s work, Raymond informs Karen about some guest in the studio. As the screening for the show gets underway, he easily debunks a couple of hopefuls. At least he thinks so at first—but each time, a member of the visiting scientists contradicts him, making him look foolish. The next day, he gets a call from the Association to help investigate a downed spaceship. Each time Raymond finds a reason to believe the spacecraft is a fake, one of the scientists contradicts him again—just as the did back at the TV station. When four-armed aliens with rayguns arrive and start tying everyone up, all seems lost until Raymond reveals the aliens are just masked men. Roy figured four-armed creatures would never think to tie people’s arms behind their backs as the “aliens” had done. He jumped to that conclusion without even using a net! Roy and his friends were never in any danger. It was all part of his initiation into the National Science Association. Who knew scientists could be such comedians? It’s always a barrel of laughs thinking you’re about to die. What a fun group to join. I’m not sure why, but Roy Raymond’s feature would last for three more years. 3. The World’s Deadliest Cargo! Captain Compass was a former private investigator hired by a shipping company as a trouble shooter. Somehow, they thought of something to keep him busy from 1941-1955. We’re catching up with him near the end of his career. 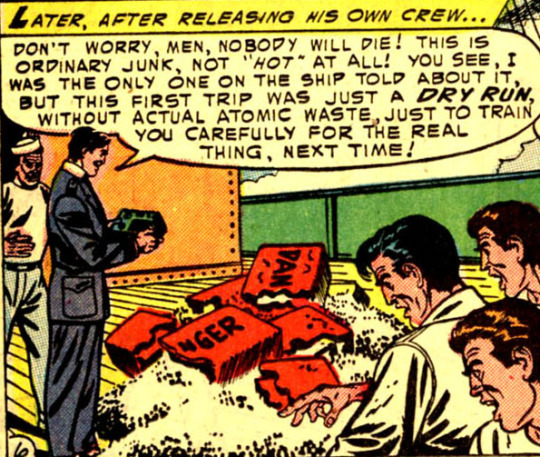 We begin with Captain Compass accompanying a shipment of atomic waste as it is disposed of by being dumped in the ocean. Not very environmentally friendly. I wonder what Aquaman would think of this. Before the dangerous cargo can be unloaded, the ship is hijacked, and the pirates use the threat of radiation exposure to pillage others ships. However, nothing can stop Captain Compass from apprehending the criminals—not even smashing the containers of lethal freight on the ship’s deck. That’s because there was no atomic waste. Captain Compass knew all along this was just a dry run for training purposes with no dangerous cargo. The problem was solved by showing there was no problem to begin with. Isn’t that the best kind of story? 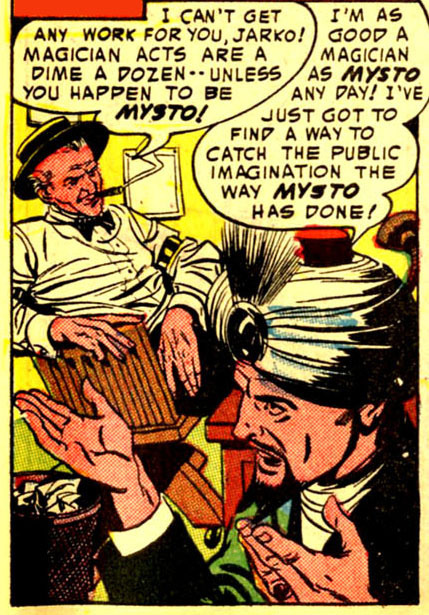 Mysto, Magician Detective was introduced in Detective Comics #203 but he wouldn’t be around for long. However, this episode starts with another magician. Jarko, a fellow magician is down on his luck. To increase his profile, he attempts to escape from “The Pharoah’s Urn”. According to legend, no one locked inside has ever come out alive. Just to make things more interesting, Jarko attempts the escape with the urn attached by rope to an airborne plane. When he doesn’t emerge in a reasonable amount of time, Mysto rescues him in mid-air. Mysto’s kind of a badass magician. Obviously, Jarko’s publicity stunt has backfired big time. He wants to attempt the escape again, but Mysto won’t let him. After overpowering his rival, Mysto disguises himself as Jarko and takes his place in the urn—this time dropped into the ocean. Mysto discovers when the lid is sealed, some kind of gas is released into the urn that affects nerve and muscle control. Don’t ask how how there could still be gas in there after so many centuries or you’ll just make the whole thing look silly. 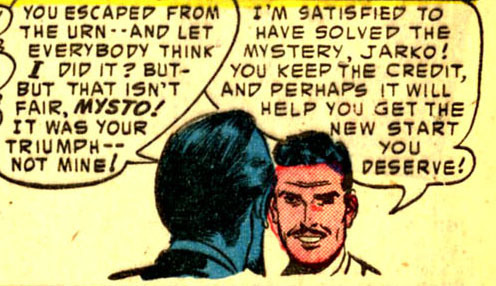 Covering the vent, Mysto is able to escape—still dressed as Jarko. No one realizes Mysto deserves the credit and he’s not going to tell. Awww. He’s a badass and a nice guy. Too bad his next appearance (in Detective Comics #212) would be his last.